So I finally got around to trying A-England polishes! After hearing all the hype about them, I kinda felt like I was missing out. The UK-based brand does have some gorgeous colours, and a lot of their polish names are themed around medieval England. So good colours, great names - what's not to like? 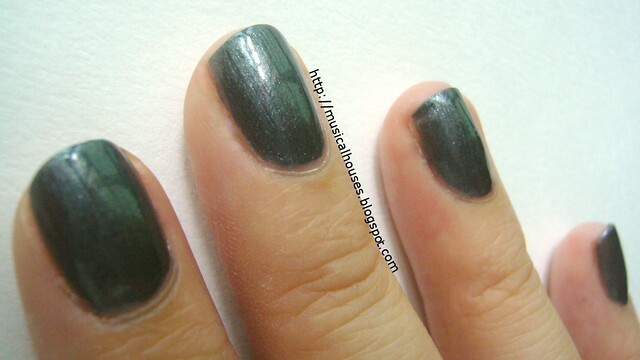 A-England King Arthur, the colour I tried, is a gunmetal grey with a shimmer finish. It's a basic colour, but still very nice to have. I think I'll have to make a comparison post to another gunmetal shade I have in my stash. But I love the name King Arthur for this polish. It kind of reminds me of the blade of his sword, or the metal of his armour. Very romantic and evocative. One of the things I really liked about this polish is that even indoors, it doesn't look black. It looks grey most of the time to me, which is always a plus. I also like the shimmer inside the polish. A-England describes it as "subtle diamond shimmer" (another very romantic description I love), and although it's subtle indoors, when the sun hits it, you can really see the sparkle. I'm all for bling on my fingers, so I love it. Application of King Arthur was good, and I had no issues with either the polish formula, or the brush size and shape. I can see why these have been so hyped-up lately. They do have some pretty colours with great formulas. Also, perhaps equally adding to the hype are all the very evocative medieval names. The only downside is that they aren't widely available. Within Asia, you can get them from Singapore-based Mei Mei Signatures, which is an online shop selling all kinds of hard-to-get-within-Asia nail polish brands. They also carry Nubar, Nfu-Oh (two other awesome brands), and a range of others, so do check it out if you're thinking of getting some! That is gorgeous! I love gunmetal on eyes and nails. I love A-England! Tristam and Perceval are my favorites from this collection. Adina's new line looks amazing, too. Can't wait to order them! For a minute there, I thought you'd bought these yourself! Haha, my mistake. As A-England polishes go this seems to be one of the more drab ones. They have some lovely pretty holographics. @Karin: Yup, the disclaimer does say that this was sent for review. I'm totally eyeing some of their holo shades (eg Tristam) next though! I agree those are the most unique a-england shades.